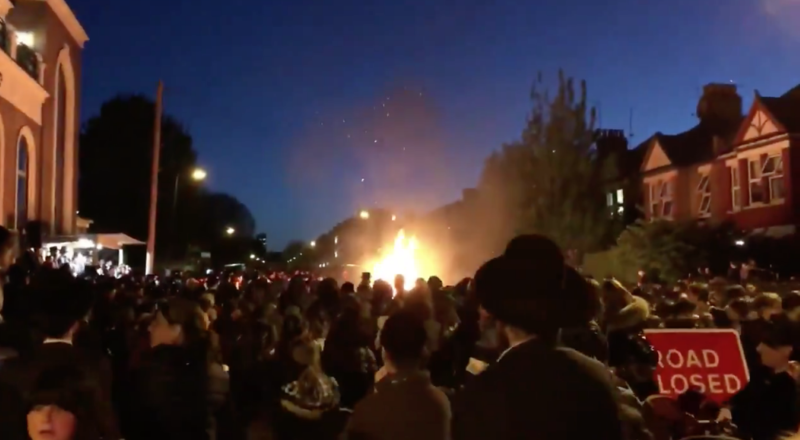 Stamford Hill leaders have praised the response of Jewish volunteers after a giant fire lit to celebrate the eve of the Lag BaOmer holiday exploded in a fireball. As questions were raised about whether authorities would continue to grant future permissions for fires, volunteers worked through the night on Wednesday and Thursday, with eight people taken to hospital with light injuries, including one child. Community leaders said that, contrary to reports, the explosion was not caused by a mobile phone but by the initial presence of something flammable, thought to be petrol. The placing of the can of petrol was not thought to be malicious. Volunteers from Hatzola and Lecheris were praised for their quick response to the explosion, which caused the flames to leap out and set fire to those standing closest. Witnesses said this was the VIP area, and among those injured was a rabbi. “There were just light injuries and the emergency response was amazing, so it was a miracle, really, because it could have been so much worse,” said Levi Shapiro, director of Stamford Hill umbrella group Jewish Community Council (JCC), who was among those lightly injured. 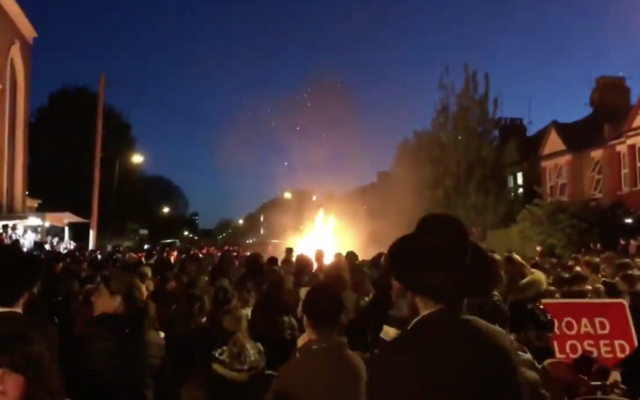 Shapiro said the community was “worried” that Wednesday’s near-miss would mean that fire and police authorities refused to grant future permits for the fires, which are lit in the middle of Ravensdale Road in Stamford Hill, near a synagogue. Hatzola said that “multiple patients were treated” at the scene and the Metropolitan Police said no serious injuries were reported. Shapiro said next year’s event – if allowed – would include “better railing to separate the crowds from the fire, a bigger distance between the people and the fire – at least four or five times as much, and more martials checking nothing dangerous gets placed on the fire before it is lit, as seems to have been the case this year”. Tonight we have assisted @Hatzola dealing with multiple patients. Hatzola is a volunteer ambulance service in the community.